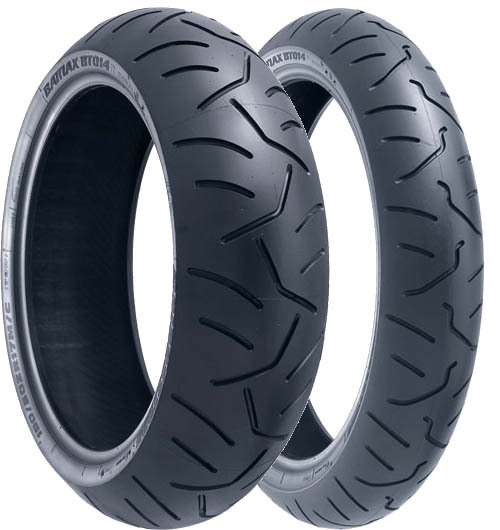 Incorporating technologies derived from Bridgestone's MotoGP participation, the Battlax BT-014 radial series is designed to maximise the street performance of hyper-sport replica motorcycles. The new range brings all-round improvements in wet and dry handling, grip, stability, durability and rider appeal. New tread compounds and carcass constructions are used on both front and rear models – the latter having a Cap and Base construction. That is an underlying layer that provides more effective shock absorption. For optimal linearity, the complementary patterns employ a mix of groove directions to control deformation over a wide range of camber angles and speeds. ‘S'-shaped groove extensions in the central area of the front-wheel tread contribute to better steering characteristics and reduced kick-back. For the rear tyre, however, chevron-shaped central lug grooves ensure efficient water drainage and lower noise levels. Bridgestone's HTSPC High Tensile Super Penetrated Cord steel Mono Spiral Belt MSB construction gives increased compression stiffness to the casing of the rear BT-014, which reduces deformation in the contact patch of the tyre. In addition, strengthened bead reinforcement increases the resistance to lateral deformation. Because the tyre is less affected by load variations, shape recovery is faster – resulting in higher stability during cornering and at straight-line speeds.